Immunoglobulin is a large Y shaped protein which is a type of antibody created by plasma cells that are applied to neutralize pathogens such as viruses and pathogenic bacteria by the immune system. Immunoglobulin respond by binding to particular antigens by critically recognizing them and aiding in their destruction. This immunoglobulin comes in different varieties known as isotypes or classes. The antibodies are heavy globular plasma proteins. The basic functional unit of each antibody is an immunoglobulin (Ig) monomer. Two types of immunoglobulin light chain occur in mammals, which are called lambda (λ) and kappa (κ). The increasing adoption of sedentary lifestyles, changing environmental conditions leading to higher cancer occurrence and growing long term illnesses is estimated to drive the growth of the intravenous immunoglobulin market over the forecast period i.e. 2019-2027. The intravenous immunoglobulin market is anticipated to record a CAGR of 7.4% over the forecast period. New uses of intravenous immunoglobulin are being discovered through rigorous R&D activities which are expected to boost the revenue of the market in upcoming years. Additionally, many multi-national companies are concentrating towards new product advances in intravenous immunoglobulin. Currently, the market is observing a vibrant growth owing to increasing demand for highly effective health offerings in the market. The market is expected to grow strongly even more on the back of increasing neurological disorders and the applications of immunoglobulin in the treatment process. 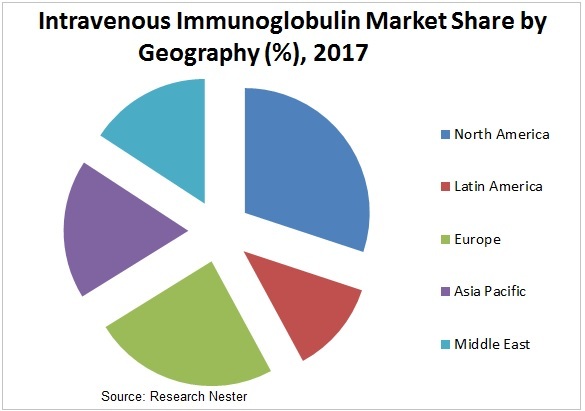 On the basis of regional platform, the global intravenous immunoglobulin market is segmented into five major regions including North America, Europe, Asia Pacific, Latin America and Middle East & Africa region. Asia Pacific is expected to drive the demand and positively impact the market growth over the forecast period on account of increasing healthcare expenditure across the region along with rising R&D activities and growing governmental support for advancements in healthcare offerings around the countries such as India, China, Japan and others. On the back of high prevalence rate of malnutrition, poor sanitary conditions and human immune deficiency virus (HIV) infection, the number of immunodeficiency diseases is at a rise which is further anticipated to propel the intravenous immunoglobulin market over the forecast period. Additionally, increasing incidence rate of various types of cancers with cancer positioned as the second leading cause of deaths around the globe and with an estimated rise to 18.1 million new cases of cancer in the year 2018 as per WHO is driving the Intravenous Immunoglobulin market across the globe. Besides, patients with long-lasting serious disorders are increasing, resulting in rise in number of cancer patients, subsequently contributing towards the positive growth of the market. Moreover, growing number of hemophilic patients along with advent of enhanced purification techniques for better plasma yield are anticipated to contribute significantly towards the growth of the market over the forecast period. Furthermore, increasing prevalence rate of hypogammaglobulinemia, chronic inflammatory demyelinating polyneuropathy (CIDP) and others are estimated to expand the applications of intravenous immunoglobulin around the world. On account of increasing current health expenditure per capita, PPP (current international $) from $1,035.026 in 2010 to $1,300.114 in 2015 around the world, the intravenous immunoglobulin market is expected to grow during the forecast period. Increasing production of immunoglobulin due to the emergence of advanced technologies along with rapid increase in the number of neurological disorders is expected to augment the market growth. Furthermore, increasing aging population around the world at a rapid incremental rate is also expected to propel the intravenous immunoglobulin market over the forecast period. Rising use of off-label indications and increasing adoption of IVIG treatments are further estimated to drive the intravenous immunoglobulin market across the globe. On account of increasing acquired and primary immunodeficiency diseases due to obesity & antibody deficiency disorders, the demand for IVIG therapies has been propelling on the back of their high affectivity and are the only available treatment option in the market. However, the various side effects associated with every type of immunoglobulin product from patient to patient along with relative stringent government regulations is estimated to serve as restraining factor in the growth of the intravenous immunoglobulin market during the forecast period.